Howard was born in Halifax County, NC the son of the late Henry C. and Ora Tanner. He was a U. S. Army veteran and retired from The Bibb Company and Wrenn Clarke & Hagan Funeral and Cremation Service. He was also preceded in death by twin sons Howard and Howell Tanner and a grandson Christopher Lee Johnson. Surviving are: his daughter Betty Ann Tanner and special friend Andy Branch of Morganton, NC; three Grandchildren, Shonda Snider and her husband Frank, Joshua Johnson and Crystal Johnson all of Roanoke Rapids, NC; three great grandchildren, Tyler Snider, Destiny Snider and J. T. Bolton, III, and a great- great grandchild Anastasia Van Aernam. 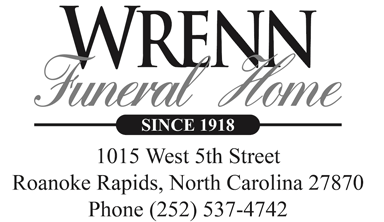 The family will receive at Wrenn Clarke & Hagan Funeral and Cremation Service, 1015 West 5th Street, Roanoke Rapids, NC, Thursday, November 8, 2018, from 7:00 to 8:30 PM and other times at the home of Frank and Shonda Snider, 72 Fairlane Drive, Roanoke Rapids, NC. Funeral services will be held in the funeral home chapel, Friday, November 9, 2018, at 2:00 PM, with Rev. Steve Perry officiating. Interment will follow in Old Cedarwood Cemetery, Roanoke Rapids, NC.